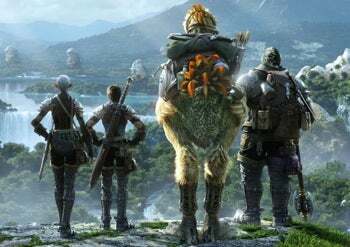 While I was up in the air yesterday crossing the pond, Square Enix launched its Final Fantasy XIV beta program, offering Final Fantasy buffs a shot at early access. If you already know all there is to know about the game, you can skip straight to the action by visiting the official site and tapping the beta signup link. Note that this is for the Windows version, and PlayStation 3 recruitment won't begin until a later date. For the rest, Final Fantasy XIV is Square Enix's official followup to Final Fantasy XI and the company's second franchise foray into massively multiplayer online roleplaying. Final Fantasy XI's been around since 2003 (an Xbox 360 version was launched in 2006) and steadily grown its user base from a few hundred thousand to around half a million subscribers as of November 2008. Where Final Fantasy XI took place in the high fantasy world of Vana'diel, Final Fantasy XIV transpires in an "unknown realm" called Eorzea. Where Final Fantasy XI employed conventional experience points to determine character abilities, Final Fantasy XIV's characters take their cues from weapons and crafting tools: What a character equips influences his or her profession and abilities, and in a nod to Final Fantasy II's skill-driven mechanics, Final Fantasy XIV won't employ levels to signify advancement. The game's due for global release (simultaneous, for a change) on the PlayStation 3 and Windows PCs sometime next year. Languages supported will include Japanese, English, French, and German, though no word yet on whether the game will employ an automatic language translator similar to the one found in Final Fantasy XI. Beta testers will be recruited to test the usual stuff: Balance, game mechanics, and bugs. Anyone (over 18) can apply for consideration, regardless of past online roleplaying experience, you'll just need to set up a Square Enix ID account. Selection will depend on the content of your application, not submission order, and Square Enix plans several rounds, so if you don't get in initially, you'll have successive opportunities down the line. Once you're in, you can stay in through to the end of the beta test phase. Whatever you do, only apply once: Sign up repeatedly and you'll deep six your application.